Winter is all around us in Vancouver these days. The past week has been foggy and cold and I am growing increasingly jealous of friends spending time in Hawaii, California, Key West and other places where you’re more likely to see an umbrella drink than an umbrella. Despite the weather I’ve started training for a busy summer of bike riding. and though I am still recovering from a car accident last fall, back and neck issues, I got out on the bike twice this past week and starting logging base mileage in preparation for feeling healthier and stronger in the weeks and months ahead. January has been quiet and I’ve been spending a lot of time combing my Lightroom archive for forgotten gems, and images from travels long ago. Without having to reach too far back I’ve pulled this from last summer, from my week working with BC Bike Race, with whom I’ve enjoyed an event week operations role the past two years, and look forward to returning this July. BC Bike Race is a traveling circus of a bike event, with stage races in seven different BC communities over seven consecutive days involving nearly 700 people including riders, crew, volunteers and rider support. Base Camp is rarely quiet, even after dark with mechanics working around the clock prepping and repairing damaged bikes for the next day’s stage. It takes a pretty tight knit and committed group to make this happen from the management on down. This week has been a difficult one for the BC Bike Race family, we lost one of our medics this week when he was struck by a dump truck while in a crosswalk. Though I didn’t know Rollie all that well, he was a colleague and an integral part of the BC Bike Race Medical Team. Riding between patches of fog and sunlight, yesterday, we enjoyed a social ride talking about last summer and the summer ahead. Back at the parking lot we shared a few thoughts about our colleague with the prevailing notion that we should never waste an opportunity to get to know someone. Rollie was a name, a face, a colleague to us, and so much more to the people who knew him best. I am sorry that I didn’t get to know you better. 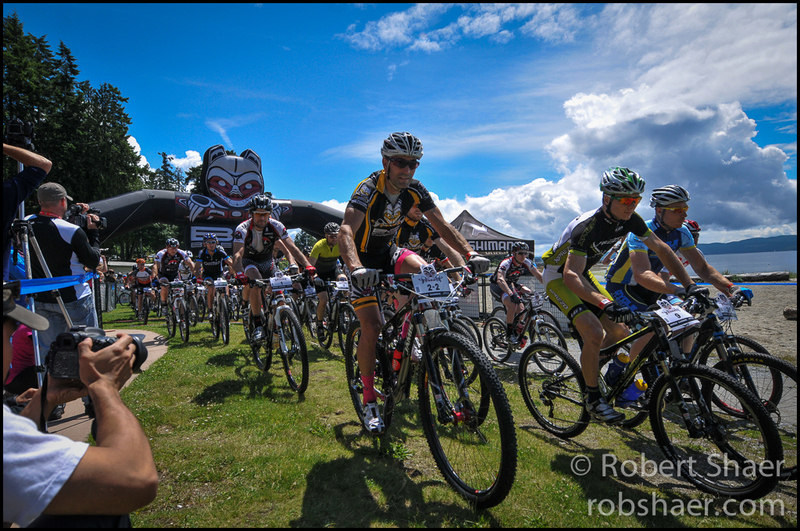 The above is a image from a sunnier day last July at the start line of the Powell River stage of the 2012 BC Bike Race. 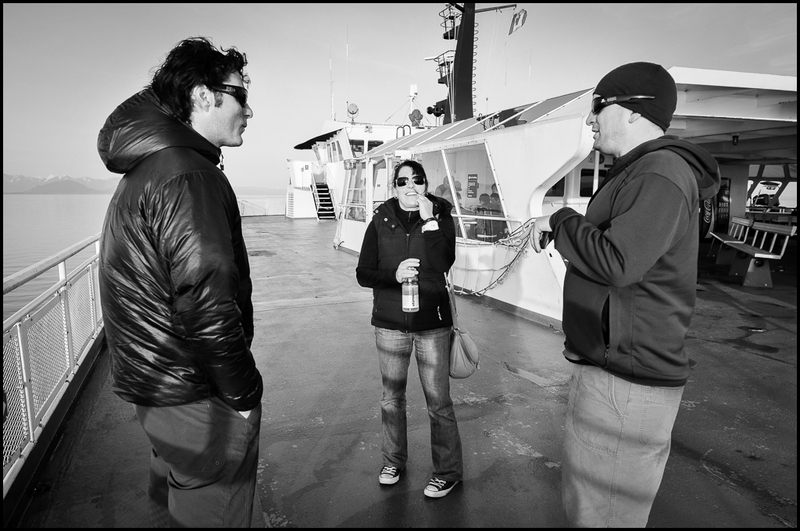 I’ve been looking for pictures of Rollie in my BCBR archives and was able to find only this, from Easter weekend in 2011, on the ferry home from a weekend retreat in Cumberland on Vancouver Island sharing a funny story with a couple BCBR friends. Rollie is on the right rocking the toque and sunglasses.